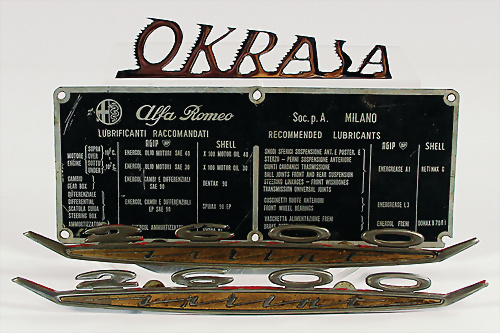 mixed lot with 4 pieces, among it 2x logo 2600, suitable for Alfa Romeo, 1 logo with the title Okrasa, aluminum lubrication schedule, probably '50s/'60s, slight traces of usage, dents, etc. You confirm, that we store your IP adress. You can revoke your consent at any time for future. The legality of the processing so far is not affected. Your bid is a maximal bid, it will only be used up to the amount of other bidders are bidding. By placing this order I acknowledge and accept the auction conditions. I will pay the knocking down price plus 19,04% (including a premium of 16% + VAT) and the postage immediately after receiving the invoice. You can not retract or edit the bid! But you can place higher bids later. You have to transmit the bid before the auction starts! You can delete or edit the bid until you transmit it. Already registered user? Login to fill your data. Login to fill your data. Sign up to our newsletter to get information about our auctions, dates, highlights and special items. Notice: We record the information that this form was already show in this session or you don´t want to see this form again in a cookie on your device.